Here's a Christmas carol that definitely started out as a poem. One thing that makes it obvious is the number of musical arrangements that have been written for it (Wikipedia lists at least 6). This poem is all about contrasts: the bleakness of winter with the new spring of hope, the glory of the Second Coming with the humble circumstances of His birth, the adoration of angels with the love of His mother, and the worth of physical gifts with the gift He really wants. I first really became aware of this poem on a Christmas card that Grandma Stay sent me years ago. I'm sure I had heard it before, but I hadn't really paid any attention to it. 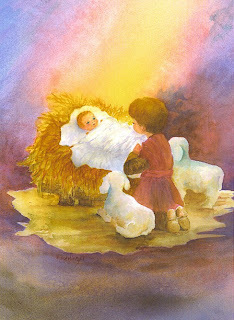 The Christmas card had a little shepherd boy and his lamb on the front, and just the last stanza of the poem. I loved the picture and sentiment so much that I kept it for years, and I probably still have it in one of my scrapbooks. Speaking of Christmas cards, I spent all afternoon addressing Grandma Stay's cards, and writing the checks that go in them. I go down to HB once a week to make sure the bills get paid, and when I went today, she had the Christmas cards out on the table. She had evidently been feeling well earlier in the week, but took a downturn today, and had almost no energy. I could tell that the cards would never even get mailed by Christmas, let alone arrive, without some help, so I offered my services. Three hours later, I had finished everything I could do without her -- she had gone to bed since she was too tired to sit in the chair and write her name anymore. I hadn't really realized what an enormous task sending cards out to 50 grandchildren can be! Here's hoping that she feels better tomorrow. By the way, everybody should make sure to send a nice newsy letter with photos to Grandma for Christmas -- that's what she really wants. We heard St. Olaf's Choir from Minnesotta sing this last night. But when they sang "Snow on Snow" they sang "Snow on snow on snow on snow on snow on snow". I thought that was pretty accurate for a choir from Minnesotta. Thanks for the update on Grandma, Karen. It's nice to be reminded of what would make her happiest for Christmas. One of the 12 days of Christmas things that Mom gave me before I came here to Oklahoma was a copy of this hymn to the tune we sang in church choir. The Halls hadn't heard it before, so Rachel sight-played it on the piano while I sang through the first verse, then everybody else joined in for the rest. It's always been one of my favorites. Yeahhhh! I am so glad to hear that someone actually SANG the music I copied. That was what I hoped would happen. This song has long been a favorite of mine as well (that's why I put it in the 12 days). I like that it focuses our thoughts on what JESUS might want for Christmas. Plus, the melody we have sung (from the Methodist hymnbook) is lovely.